A beautiful 2013 SportStar Max brokered by Evektor dealer Dreams Come True. 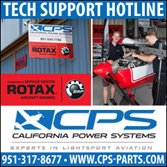 Used aircraft sales are a growing part of their enterprise. At a reception ending Day Two, DeLand Showcase Director Jana Filip reported that front gate receipts were greater on Thursday than either Thursday of the two prior years of the Showcase. Then she announced Friday's gate was greater than the two previous Fridays. DeLand Showcase 2018 is the third running of the event. Showers rolled in threatening Showcase's perfect weather record although the rain didn't start until exhibitors and sponsors had gathered in the main show center tent. Under shelter, live music was presented by the Flying Musicians Association, lead by professional music man, Gary Filip. A catered dinner fed the group and as the evening concluded, the rain died off as if on cue. A couple tents were damaged by strong winds including one in the Dreams Come True booth of Steve and Debbie Minnich and an EAA Chapter food tent. No airplane damage was reported. New Jabiru distributor Scott Severen of U.S. Sport Planes said he exceeded his first year sales goal. Yesterday's Day One post related several conpanies giving satisfactory results for their sales this year. Perhaps encouraged by a buoyant economy, pilots are choosing new LSA but in parallel more importers and manufacturers are helping to move used LSA. The fleet has grown enough to generate a good supply of low-time, desirable Light-Sport Aircraft. 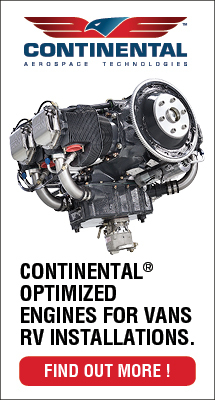 Any representing looking to sell new machines can boost their enterprise by also facilitating the sale of used aircraft. In either new or used transactions, pilots win as they can acquire aircraft that interest them. It's all good and 2018 is proving to be a respectable year. Seamax is another company pleased with their U.S. developments. 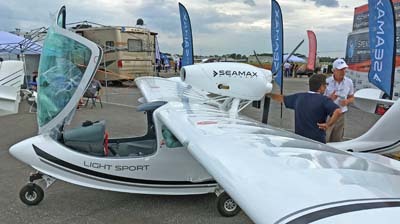 We interviewed lead designer and business owner Miguel Rosario to find his lightest-of-the-LSA-seaplane-fleet Seamax is developing their business on the campus of Embry Riddle Aeronautical University. With care and long experience, Miguel has built an active enterprise that has supplied more than 150 aircraft around the globe with about 10% flying in the USA. That number is sure to grow with the Brazilian company's American operation, an excellent price point among LSA seaplanes, and sprightly performance SuperPetrel reports delivery of eight units in the last year after establishing their U.S. base. Global sales over many years are now approaching serial number 400 according to representatives from the Ormond Beach, Florida enterprise of Brazilian investors associated with Scoda Aeronautica. This seaplane maker is also growing its installed base in America for this long-established design that was thoroughly updated when Scoda (formerly Edra) Aeronautica took over Super Petrel. An FAA audit proved the quality of their work as they earned SLSA credentials. Inside the tent, we did an interview with Sensenich president Don Rowell. The very popular maker of wood, metal, and composite props reported strong business that is challenging the company to keep propellers in stock. To address the demand, Sensenich is expanding and bringing new CNC equipment. We will be visiting the factory just before Sun 'n Fun 2019 to give viewers a tour of their new facility and equipment. As with yesterday's report, this is not an exhaustive review of each exhibiting company. Yet the sum of reports from company after company reinforces the view that 2018 qualifyies as a solid year. I see the happy smiles of new pilot owners on the field. At a reception ending Day Two, DeLand Showcase Director Jana Filip reported that front gate receipts were greater on Thursday than either Thursday of the two prior years of the Showcase. Then she announced Friday’s gate was greater than the two previous Fridays. DeLand Showcase 2018 is the third running of the event. Showers rolled in threatening Showcase’s perfect weather record although the rain didn’t start until exhibitors and sponsors had gathered in the main show center tent. Under shelter, live music was presented by the Flying Musicians Association, lead by professional music man, Gary Filip. A catered dinner fed the group and as the evening concluded, the rain died off as if on cue. A couple tents were damaged by strong winds including one in the Dreams Come True booth of Steve and Debbie Minnich and an EAA Chapter food tent. No airplane damage was reported. 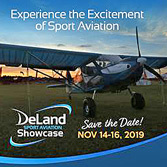 The Sport Aviation Village is where DeLand airport is developing a manufacturing hub of interest to producers. 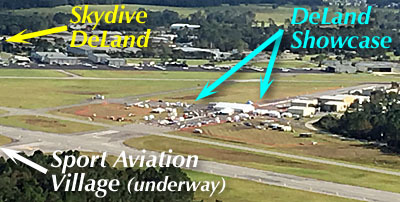 Skydive DeLand is one the most active parachute operations in the world. The second year of the DeLand Showcase is over. Most folks I asked judged it a success. Year #2 year of this three-day event again logged weather that could not have been better. Sunny blue skies dappled with puffy Cumulus clouds, modest winds, and temperatures in the 80s (high 20s C° for our metric readers). DeLand is two for two! What more could you ask? Well, that depends. Customer traffic "was up every day over the same day last year," observed show director Jana Filip. That is certainly trending the right direction. Was it enough growth to satisfy a key component of these shows, the vendors? That depends on whom you ask. Aerolite 103 recorded a good show, topping off a strong year. One prominent company told me they did not know if they'd be back next year, but few will be surprised to see them return anyway. After spending money on the exhibit space and the logistics of moving aircraft, preparing for the show, and housing staff on-site, vendors seem ever to yearn for more "foot traffic." While acknowledging the yearning, most sales pros know that the question that truly counts is… Did enough customers show enough interest that you took orders or at least obtain qualified leads? 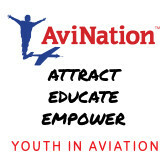 Customers want to know, "Will I find aircraft and aviation gear I find interesting and will I be able to speak to the representatives to get my questions answered?" Others ask, "Can I get a flight or two or three in aircraft that interest me so I can make a better purchase decision?" The answer to both the last questions is emphatically, "Yes!" In fact, I believe these focused-venue shows are quite good at putting buyers and sellers together in helpful ways. That's why they succeed, even while being smaller in footprint and traffic. 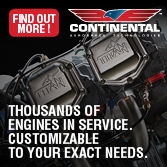 When we customers get questions answered, we make purchase decisions. If we get to fly aircraft, we move closer to a flying machine catching that can fulfill our dreams. DeLand succeeded in this important respect. Lots of folks spent time checking our aircraft of interest, such as this Super Petrel LS. Several vendors with whom I visited near the end of DeLand #2 said they had sold aircraft and/or gotten good leads. Of course those folks will return next year — show dates were announced: November 1-2-3, 2018. In my view as a reporter who attends 8-10 shows a year, what makes these smaller, focused-venue events worthwhile is precisely that they do not have immense crowds. Two main reasons explain why. First, those who do attend are clearly interested since, for example, these events have no aerobatic airshow acts or flocks of warbirds to admire. If you go to Midwest, DeLand, or Sebring, it is because you like light aircraft kits, LSA, ultralights, or the gear used on these flying machines. Others come for the forums or workshops oriented to these aircraft types. Engines are always a good draw, for example, Mark Kettering's AeroMomentum. We shot a video about their new engine models. Yes, it's true that people who go the the giant airshows to see warbirds may, probably by chance, see a shiny new LSA they could end up buying. However, the odds are far greater that they'll walk right past the LSA or kit-built lightplane by en route to the warbirds or whatever other aviation sector attracts their interest. Does that huge amount of foot traffic do a vendor any good? I'm not sure it does. Do you have to pay for it? Absolutely… both vendors and attendees spend more at the big shows. The payoff can be that a company gets more media attention or some other benefit, but the cost is a sure thing. Smaller shows cost less. The people trying to sell us the most affordable aircraft have to watch expenses closely. 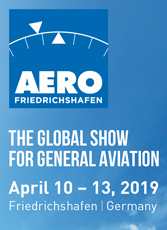 Secondly, customers who attend these focused shows can generally get all the face time they want with the representative of a certain aircraft brand or flying accessory developer. They can ask detailed questions and get relaxed, friendly, thorough responses. 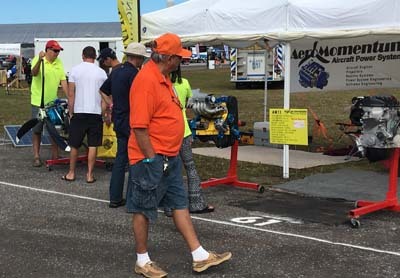 At big events like Sun 'n Fun or Oshkosh, the crowds are often so thick that you can't get to a company rep' or they can't take the time to give a full answer to your question. Taking a demo flight at the biggest shows can be very time consuming — although it's much better at the lightplane areas contained in each of the major events. I love the big shows just as most of us do. They are certainly important events. Yet the smaller shows are where the action is given their focus on a single sector (light planes). Thanks to Midwest, Copperstate, and DeLand this fall. Welcome to Sebring 2018 in January! The second year of the DeLand Showcase is over. Most folks I asked judged it a success. Year #2 year of this three-day event again logged weather that could not have been better. Sunny blue skies dappled with puffy Cumulus clouds, modest winds, and temperatures in the 80s (high 20s C° for our metric readers). DeLand is two for two! What more could you ask? Well, that depends. Customer traffic “was up every day over the same day last year,” observed show director Jana Filip. That is certainly trending the right direction. Was it enough growth to satisfy a key component of these shows, the vendors? That depends on whom you ask. One prominent company told me they did not know if they’d be back next year, but few will be surprised to see them return anyway. After spending money on the exhibit space and the logistics of moving aircraft, preparing for the show, and housing staff on-site, vendors seem ever to yearn for more “foot traffic.” While acknowledging the yearning, most sales pros know that the question that truly counts is… Did enough customers show enough interest that you took orders or at least obtain qualified leads? The Petrel is back now as the Super Petrel LS. 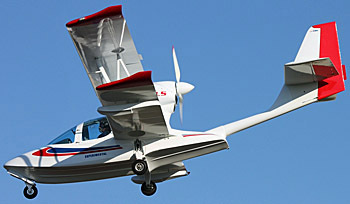 A Brazilian-manufactured seaplane, the LSA candidate is represented by Florida Light Sport Aviation. We spoke with proprietor Brian Boucher about the flight characteristics of this handsome bi-wing LSA seaplane. Present in the Experimental class, SLSA approval is expected by AirVenture 2013 as Brazil uses the same ASTM standards as does FAA. Catch this video complete with on-water flying scenes. The Petrel isn't new but to Americans the Super Petrel LS is brand new. We speak with the designer to ask about the new-to-Americans model and we'll have more later after she's flown off her FAA-mandated 40 hours. Meanwhile let's have a look at the only biplane seaplane LSA and hear how it works, directly from the designer's point of view. The airplane is being offered by a dealer in the Daytona Beach, Florida area. The Petrel isn’t new but to Americans the Super Petrel LS is brand new. We speak with the designer to ask about the new-to-Americans model and we’ll have more later after she’s flown off her FAA-mandated 40 hours. Meanwhile let’s have a look at the only biplane seaplane LSA and hear how it works, directly from the designer’s point of view. The airplane is being offered by a dealer in the Daytona Beach, Florida area. Super Petrel seen taxiing at the Spruce Creek Fly-In airport in Port Orange, Florida. Older readers may remember, "The Russians are Coming," a silly movie about a supposed Russian invasion from 1966. It was a comedy set during the Cold War. Here in the new millennia a different sort of aviation invasion appears to be happening. This time it's the Brazilians and they are not so much invading as looking for a better place to set up shop. A decade ago, Brazil was riding high, one of the so-called BRIC countries on the rise as new economic powerhouses. Flush with commodities revenue the government was free to dole out public money very generously and things were looking good. Here in 2016, that situation has changed dramatically. The economy is sluggish, President Dilma Rousseff has been earning approval ratings in single digits, and doing business in Brazil is said to have increasing challenges. Maybe that's why Brazilian aviation giant Embraer started making bizjets in Melbourne, Florida ... or maybe this country is where many of their fancy Phenom jets sell. Regardless, home country issues are definitely why Brazilian SLSA maker, Paradise Aircraft, established a base at the Sebring airport. Now witness a North American base for amphibious SLSA manufacturer Scoda Aeronautics (formerly Edra Aeronautica, though this was only a name change as the ownership remains the same). Rodrigo Scoda is the principal of the South American company. He has now joined forces with North Americans Brian Boucher and David Kyrk to create a solid U.S. presence. "Super Petrel USA Inc., recently leased a 6,000-square-foot hangar at Ormond Beach Municipal Airport where it will open an aircraft assembly, sales, distribution, and parts center," wrote journalist Clayton Park of the Daytona Beach News Journal newspaper. 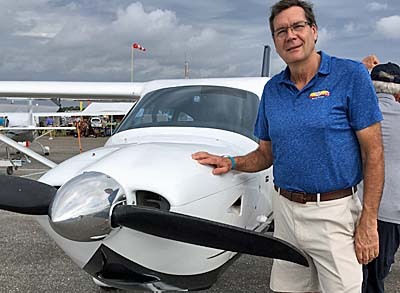 Park's article continued, "Brian Boucher, a Spruce Creek Fly-In resident who works as a commercial airline pilot, teamed up with the founder of Rio Claro, Brazil-based Scoda Aeronautica and another Brazilian businessman to form Super Petrel USA on January 1, 2016." The newly formed subsidiary company signed a three-year lease at the airport, according to airport manager Steven Lichliter. "We were contacted by telephone and by email in October" by the owners of Super Petrel, said Lichliter, according to writer Park. "They came for a visit and were impressed with the general atmosphere." The city's economic development director Joe Mannarino, said Super Petrel USA will start with four employees. Initially Scoda Aeronautica will continue all fabrication and major assembly in Brazil, however, the principles of the company — which include Rodrigo Scoda and other Brazilians plus Port Orange- Florida-based Brian Boucher — have indicated their plans could become more ambitious, with increasing amounts of work done in the USA. As with many imported Light-Sport Aircraft a sizeable portion of the airplane comes from the USA already. Items such as avionics, brakes, wheels, lighting, emergency parachutes, intercoms, headsets, ELTs and numerous other components are supplied from American companies. Anyone can appreciate that it makes sense not to ship these items overseas for assembly only to ship them back to the USA. Add tariffs and other government fees into the equation and it becomes even more obvious to send airplanes without those and other items, adding them once the aircraft arrives in the U.S. Most pilots understand that doing increasing work in the USA is efficient to supply the North American market. Yet, both Super Petrel USA and Paradise Aircraft have stated that shipping products from Brazil to other overseas markets has become more difficult. So, both U.S.-based outlets have indicated their longer term plans include exporting from America to other countries. Internationally-accepted ASTM standards aid this global effort. From the early days when LSA were overwhelmingly built overseas — often using much lower priced labor, for example, in former USSR statellite countries — the situation has changed dramatically. Not only are American producers making a growing share of LSA in the USA for U.S customers but they are beginning to export more. The Brazilian aviation entrepreneurs are merely using this dynamic to their advantage. 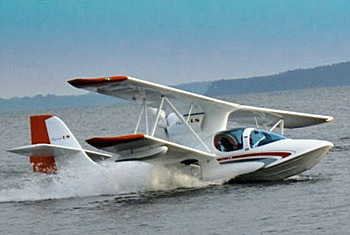 Edra, now Scoda Aeronautica has been building Super Petrel amphibious biplanes for 15 years, since 2001. The Brazilian company has sold more than 350 Super Petrels to pilots in 23 countries. According to a news release from the company ten of the SLSA models were sold in the US in the last six months of 2015. At a time when expectations run high for California's Icon Aircraft to start delivery of their long-awaited A5 LSA seaplane, a window of opportunity exists for companies like Super Petrel, Searey producer Progressive Aerodyne, and startups such as MVP.aero and Vickers Aircraft. Icon has taken orders for a reported 1,500+ aircraft but new orders may be facing a considerable wait, opening the door for competitors. Price is another consideration. With Icon's A5 crossing the $200,000 threshold, a Super Petrel selling for $155,000 to $170,000 is a relative bargain. Seaplanes of any airplane sector are always more costly than the land version so $155,000 is genuinely a fair value for an airplane that looks as good as the Super Petrel. Searey is also available in this price range. Given my close proximity to the new Super Petrel USA facility, I expect to gain experience flying the biplane seaplane and will report more as developments continue. Older readers may remember, “The Russians are Coming,” a silly movie about a supposed Russian invasion from 1966. It was a comedy set during the Cold War. Here in the new millennia a different sort of aviation invasion appears to be happening. This time it’s the Brazilians and they are not so much invading as looking for a better place to set up shop. A decade ago, Brazil was riding high, one of the so-called BRIC countries on the rise as new economic powerhouses. Flush with commodities revenue the government was free to dole out public money very generously and things were looking good. Here in 2016, that situation has changed dramatically. The economy is sluggish, President Dilma Rousseff has been earning approval ratings in single digits, and doing business in Brazil is said to have increasing challenges. Maybe that’s why Brazilian aviation giant Embraer started making bizjets in Melbourne, Florida … or maybe this country is where many of their fancy Phenom jets sell. Brian Boucher's first Super Petrel LS in the USA is licensed Experimental but has since been accepted by FAA as a Special LSA. Landing gear retracts and doors open widely or can be removed. Super Petrel LS's interior is roomy (45 inches wide) with comfortable seats. The center lever is the landing gear and Super Petrel has a warning system to prevent mishaps. North American representative Brian Boucher. Winter has finally released its icy grip on the northern states that were so punished over the past few months. Here in the "Sunshine State" of Florida, it feels like summer. So what do pilots do in the summertime, in Florida? Go fly seaplanes, of course? What else? Indeed, quite a flock of seaplanes and floatplanes converged on the central Florida city of Tavares, about 45 minutes driving time northwest of Orlando. Appropriately, the area is known as "lakes district" for all the bodies of water. City leaders portray the Tavares as "America's Seaplane City" and to reinforce that, they have developed their lakefront to include a very welcoming seaplane base with bigger plans underway. On Saturday, April 26th more than 40 seaplanes flew in for the event. One of those was Edra Aeronautica's Super Petrel LS, one of the newest Special LSA in the fleet. My friend and Spruce Creek Fly-in neighbor, Brian Boucher, is the North American representative for this interesting seaplane and I finally got my first flight in it. Super Petrel LS is a design said to be in its fifth generation. Indeed, I know of the model for more than 20 years. When I first discovered the seaplane, it was represented by a Canadian outfit. 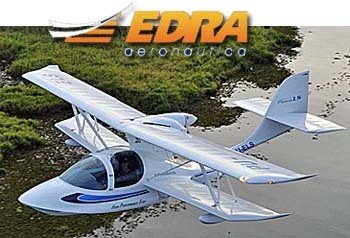 However, in 1997 aeronautical engineer and pilot Rodrigo Scoda founded Edra Aeronáutica, the present manufacturer based in Ipeúna, Brazil in the state of São Paulo where the company operates its own airfield (SDED). Super Petrel particularly distinguishes itself by its biplane design. Why use two wings? Seaplanes or floatplanes want to get off the water as quickly as possible. Many years ago a few hours in a Cessna 172 on floats taught me why and explained the steel bracing installed inside the cabin. When a seaplane runs long on water, it takes a pounding in anything but smooth water, which itself causes a "stickiness" or "surface tension." Leaving the surface faster prolongs airframe life and is why many seaplanes boast their short takeoff runs. Long wings can accomplish the same purpose but a long span can be more difficult to maneuver in beaching or docking situations. Two sets of wings generate additional lift yet do so with relatively short span. Another advantage is the sponson on each side can be secured to the wing structure without long support tubes as you see on other seaplanes. A downside is that Super Petrel's lower wing prevents docking. You'll either have to beach the aircraft or use a ramp — easy enough in many situations — or tie it to a water buoy and use a boat or get wet. 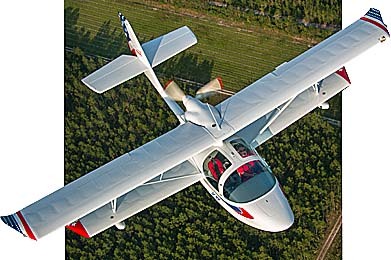 Petrel offers a wide cabin like many Light-Sport Aircraft, 45 inches to be specific. Certainly it was roomy for two average-sized fellows like Brian and myself. The seats were exceptionally comfortable, with the seat cushion extending to your knees in a graceful curve that is very supportive. Only the seat back moves, through three positions that you set before entering. Some occupants may need additional cushions for position or comfort and Brian told one fellow he was too tall to fit; the man said he stood 6 foot 6 inches. The doors swing 180 degrees forward (photo) and can be removed for flying off land, which I would absolutely do ... being an old ultralight enthusiast. For choppy water operations, you'll probably want to keep them on as Super Petrel sits low in the water. However, the airplane also has a bilge pump if some water splashes in during takeoff. Indeed, the older version had only a summer windscreen and not a full enclosure. To accommodate moisture, Petrel's floor is hard surface. Brian's present Super Petrel has a mostly analog panel using a removable Garmin Aera for GPS and other digital functions. However, new models coming in will use Dynon's SkyView and can be configured in various ways. Although the model can handle 55 pounds of luggage, space to stow such gear is limited; fortunately, sport seaplanes are rarely used for long cross country flights where you need extra luggage. Let's cover some basic specifications: Span is just under 29 feet; wing area is 161 square feet; wing loading is 8.2 pounds per square feet; empty weight is 775 pounds, according to the factory, though this depends on what equipment the owner installs; gross weight is not 1,430 pounds as you might expect but 1,320 pounds; useful load is 545 pounds; Fuel capacity is 25 gallons; so, payload with full fuel is 395 pounds; cockpit width is 45 inches; water takeoff run is less than 400 feet, according to published specs; wheel takeoff on hard surface is 260 feet; cruise is about 90 knots; never exceed speed is 114 knots; stall is 35 knots; maximum endurance is five hours. On the ground, Super Petrel exhibits good manners and one great trick. Thanks to a swiveling nosewheel and differential braking operated by heel pads, Brian showed the airplane can turn around on even a narrow taxiway, turning handily within its own wingspan. The airplane is loaded very lightly on the nosewheel facilitating this, but that means you need to consider loading before flight. With one lightweight occupant, a placard tells you how much water ballast to add in a compartment in the nose. A hatch opens to reveal the nosewheel retract cavity and a water tank for such ballasting. With two normal size persons on board this step is not necessary. On the water, Super Petrel was very comfortable. You can whiz around on step like a speedboat and the low wings dip a sponson in the water to keep you level though flight controls also work well. Super Petrel is simple with no flaps and no water rudder. To maneuver on water a modest prop blast over the tailplane directs you amply well. You can swing the doors forward to allow more airflow though you'll want to keep a hand on them when turning in windier conditions. In flight Super Petrel has very cooperative handling with almost no need to use the rudder pedals. I way overused them at first and then realized most of flight controlling is done with the joystick. Stall is very slow and docile, a word that can be fairly used to describe overall handling qualities. Takeoff from land or water involves full power and some back pressure. Landings proved to be easier than expected. Contrary to some seaplanes you flare Super Petrel and meet the water with the nose higher. Porpoising occurs with most seaplanes but Petrel quiets this easily with some back pressure. Done properly, Petrel is easy to land and after only two previous trials my third was smooth. Visibility is very good as you sit forward of the wings and watching for traffic in the air or on the water found no obstructions. Petrel uses the Rotax 912 or 914 but Brian is excited about the potential of the new 912 iS Sport with its higher torque and power output. "That's a great combination for seaplanes," he added. Finally, price: Brian's business, Florida Light Sport Aviation, plans to sell Super Petrels for around $135,000, a figure that is competitive with most land LSA and significantly better priced than most seaplanes or floatplanes. Order time and support from Brazil is reasonable and Brian makes a great connection to Americans and Canadians. I thoroughly enjoyed flying Super Petrel LS and you might, too. I flew with Brian to the City of Tavares, Florida Seaplane Fly-In. More than 40 aircraft splashed in for the event and good crowds enjoyed aerial contests to include grapefruit bomb drops and spot landings, all done close to the shore. A number of seaplanes and one helicopter participated with an immaculate Beaver on floats winning at both tasks. A very short video below paints a picture of the seaplane base. Winter has finally released its icy grip on the northern states that were so punished over the past few months. Here in the “Sunshine State” of Florida, it feels like summer. So what do pilots do in the summertime, in Florida? Go fly seaplanes, of course? What else? Indeed, quite a flock of seaplanes and floatplanes converged on the central Florida city of Tavares, about 45 minutes driving time northwest of Orlando. Appropriately, the area is known as “lakes district” for all the bodies of water. City leaders portray the Tavares as “America’s Seaplane City” and to reinforce that, they have developed their lakefront to include a very welcoming seaplane base with bigger plans underway. On Saturday, April 26th more than 40 seaplanes flew in for the event. One of those was Edra Aeronautica’s Super Petrel LS, one of the newest Special LSA in the fleet. My friend and Spruce Creek Fly-in neighbor, Brian Boucher, is the North American representative for this interesting seaplane and I finally got my first flight in it. LSA Off to Sun ‘n Fun — Excitement Building! 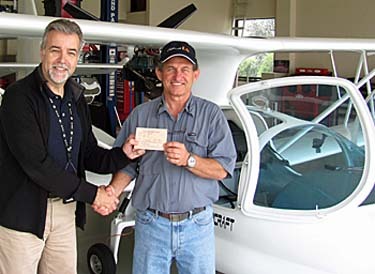 Gregory Gaulin of the FAA gives Florida Light Sport Aviation's Brian Boucher the first airworthiness certificate for the Super Petrel LS. Slings and airliners are all headed to Sun 'n Fun 2014. Super Petrel LS from Edra Aeronautica — As described in our earlier article, Edra Aeronautica was nearly done with their acceptance by FAA to be able to sell their handsome biwing Super Petrel LS in the U.S. as a Special (fully manufactured) Light-Sport Aircraft. The "almost" is gone now and Daytona Beach, Florida-based importer Brian Boucher of Florida Light Sport Aviation has the pink Special Airworthiness card in his LSA to prove it (photo). Brian's business also represents the Flight Design CTLSi, so he has two distinctive Light-Sport models he can demonstrate. Florida Light Sport Aviation is based at the Spruce Creek Fly-in (just like ByDanJohnson.com! ); he and wife Jean will be at Sun 'n Fun in space LP-38 past the LSA Mall in Paradise City. Another Super Petrel LS will be available for examination in the LSA Mall as will his CTLSi. Brian is an airline pilot but enjoys Light-Sport Aircraft when he isn't jetting around the globe. Sling from The Airplane Factory — The boys from The Airplane Factory USA are en route from Southern California in the Sling LSA, making one of the longest treks of all exhibitors in America. While a long flight, you may remember this is the airplane that developer Mike Blyth and partner James Pitman flew around the world shortly after finishing it. Principal Matt Litnaitzky and associate Ryan Ruel report that Sling has taken off around the USA in the last year thanks to positive press in aviation media. "Sling 2 kit sales are also on the increase," they noted. "We also have orders for the first several Sling 4 [four seat] kits, which will be delivered to customers in the next couple of months." Ready-to-fly Sling SLSA models are also selling. "We are very excited to be bringing the Sling to Florida for the second year in a row. We'll be located in ... Paradise City, and available for demo flights all day, every day. 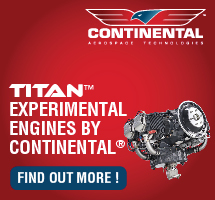 Come see us in our booth, LP-29, to check out the airplane and go for a ride." Sling's space is just past the LSA Mall and near the Super Petrel LS. Since Matt also supplies MGL Avionics, you can check out these advanced instruments in their Sling when you visit. Tecnam's Astore U.S. Debut — I got to see it last year at the German Aero show, but now the newest model from LSA giant Tecnam will make its American debut. It was not flying at Aero (though it has now), however, I did get inside to find it a sophisticated and exceptionally roomy LSA; fellows much taller than me should fit well. Astore is the company's second low wing model after Sierra with such innovations such as an Apple iPad® mini supplied with each aircraft as standard. 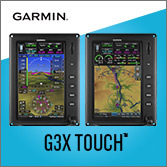 The Levil G Mini, using its WiFi connection, provides a full Primary Flight Display on the iPad® mini using compatible third party applications such as Air Navigation Pro or similar. Additionally, the pre-installed dedicated app will compute the actual Weight and Balance, provide checklists, and include all the Pilot Operating Handbook sections. Tecnam will have a collection of their LSA models and more at their MD-21 space at Sun 'n Fun plus one model can also be seen and demo flown from the LSA Mall in Paradise City (Astore is planned for a couple days of demo flying as well). It's time to leave the computer and head to Sun 'n Fun 2014. See you at the show! Super Petrel LS from Edra Aeronautica — As described in our earlier article, Edra Aeronautica was nearly done with their acceptance by FAA to be able to sell their handsome biwing Super Petrel LS in the U.S. as a Special (fully manufactured) Light-Sport Aircraft. The “almost” is gone now and Daytona Beach, Florida-based importer Brian Boucher of Florida Light Sport Aviation has the pink Special Airworthiness card in his LSA to prove it (photo). Brian’s business also represents the Flight Design CTLSi, so he has two distinctive Light-Sport models he can demonstrate. Florida Light Sport Aviation is based at the Spruce Creek Fly-in (just like ByDanJohnson.com! ); he and wife Jean will be at Sun ‘n Fun in space LP-38 past the LSA Mall in Paradise City. Another Super Petrel LS will be available for examination in the LSA Mall as will his CTLSi. Brian is an airline pilot but enjoys Light-Sport Aircraft when he isn’t jetting around the globe. See our latest video on the Super Petrel LS. Brian Boucher (center) is the U.S. importer of Super Petrel LS. 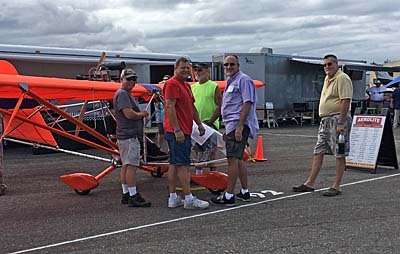 He is flanked by famous aviation journalists Dave Unwin (L) and James Lawrence (R) near his home at the Spruce Creek Fly-in. In the beginning ... OK, a few years ago, FAA went around to a couple dozen LSA producers to evaluate the state of the then-new LSA industry. The agency teams did not conduct an audit, they emphasized. More intensive examinations, actual audits, followed in recent years. Last year the agency issued new guidance to help them and everyone else judge who really was and was not a manufacturer. If the need for such a definition surprises you, remember, the brave new world of Light-Sport Aircraft threw curves to government regulators, captains of industry, aircraft design geniuses, plus all we rank and file customers. Everyone learned a great deal as an entirely new sector of aviation was given birth ... one, by the way, with a worldwide impact as more countries sign on to the ASTM standards method of assuring airworthiness. The LSA industry is now a few months away from its tenth birthday and the gears of production are beginning to mesh more smoothly than ever. A CASE IN POINT: Just today, while I visited with importer Brian Boucher of Flight Light Sport Aviation, he received a call from FAA saying that a letter will go out in the next day or so confirming that Brazilian manufacturer Edra Aeronautica successfully completed their audit. One more step remains — a visit from an FAA MIDO ASI (Air Safety Inspector to those of you not intimate with the agency's abbreviation-coded titles) — to provide the final review of the first Super Petrel LS in the USA. After that, Brian will be able to offer ready-to-fly examples of the handsome biwinged amphibian. Following the ASI examination — presuming all goes well, as it should since FAA just microscoped the company via their in-Brazil audit — Super Petrel LS will become number 134 on our SLSA List. 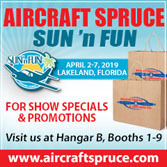 Although slightly premature, we already added it because we're like many others scrambling to depart for the Sebring LSA Expo to start Thursday this week. Congratulations to Edra and Brian! It was almost exactly one year ago when I first wrote about this airplane, but that makes it sound like something new. The truth is, Petrel is quite an established name. Some 20 years ago, while I was working with BRS Parachutes, we became familiar with an earlier iteration of this design. The Super Petrel is significantly evolved from that more basic amphibian. The LS tag that now follows the name attests to the airplane's aim at the Light-Sport market. Two wings and amphibians aren't common but as you ponder what seaplanes need to accomplish, the idea makes plenty of sense. Getting off the water as quickly as possible is preferable because pounding through waves is hard on any water bird, certainly one built lightly to fit LSA parameters. Super Petrel wings have 161 square feet of area, giving a wing loading of only 8.2 pounds per square feet. More wing area provides more lift and the lower wing helps amplify ground effect. Sponsons can be securely fitted to the lower wing rather than on long tubes as is common. Finally, the biwing design allows a short 28 foot span, which helps in maneuvering the aircraft on water. More than 200 aircraft are reported flying in 22 countries. Brian indicated he has potential customers waiting for Super Petrel LS to pass its audit and become available for sale. Those folks have but a short wait now. Meanwhile Brian and team are working furiously to prepare the roomy seaplane for the viewing pleasure of those headed to Sebring. If you're one of the lucky ones — especially if you can escape the "Polar Vortex" cold that recently descended on so much of America — look up Super Petrel LS at Sebring as you peruse all the great Light-Sport models you'll see on display. Remember Sebring is a great place for demo flights, so get your name on the schedule with the planes of your choice and get your smile cranked up and ready. In the beginning … OK, a few years ago, FAA went around to a couple dozen LSA producers to evaluate the state of the then-new LSA industry. The agency teams did not conduct an audit, they emphasized. More intensive examinations, actual audits, followed in recent years. Last year the agency issued new guidance to help them and everyone else judge who really was and was not a manufacturer. If the need for such a definition surprises you, remember, the brave new world of Light-Sport Aircraft threw curves to government regulators, captains of industry, aircraft design geniuses, plus all we rank and file customers. Everyone learned a great deal as an entirely new sector of aviation was given birth … one, by the way, with a worldwide impact as more countries sign on to the ASTM standards method of assuring airworthiness. The LSA industry is now a few months away from its tenth birthday and the gears of production are beginning to mesh more smoothly than ever. More LSA Seaplanes … How About A Biplane Amphib? In some ways a biplane is a natural in the water — more wing area gets off the water quicker and offer a shorter span for easier manuevering. Super Petrel LS offers comfortable seating and 45-inch-wide cabin. Fully retractable tri-gear is part of the amphibian's design. A forward hatch reveals the nosewheel cavity. Sebring starts next week ... yes, next week! A new year is here and for nine years now that means it is time for the Sebring U.S. Sport Aviation Expo, or just Sebring LSA Expo if you prefer. Executive Director Jana Filip and her team have been putting in the long hours to get ready and to enlist all the right exhibitors. 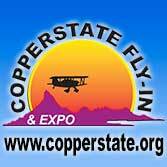 You should get to see all the Light-Sport and other light aircraft you want in this concentrated event. One of those aircraft has not been seen in America for years and even then not as the Super Petrel LS. 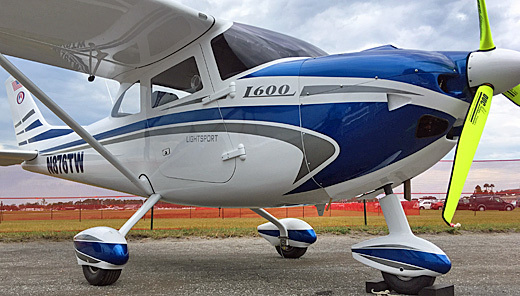 Longtime veterans of recreational aircraft might remember the Petrel — it's been around for more than 10 years — but this soon-to-be SLSA entrant will look fresh to nearly everyone. New Flight Design dealer and Florida Light-Sport Aviation owner Brian Boucher is assisting airport neighbor Jerry Scheid to bring this first-of-its-kind Super Petrel LS to Sebring for your closer examination. Scheid has established PS-Bird LLC to represent the striking aircraft. Interested parties may call 386-760-4140 for more info. The new Super Petrel LS still flying off its hours as an Experimental Exhibition category aircraft. 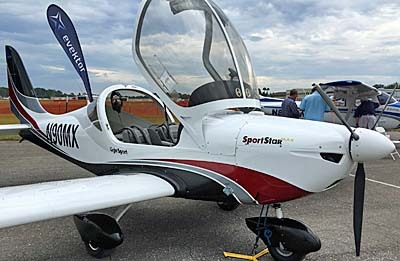 Brazilian manufacturer Edra Aeronautica will pursue Special Light-Sport Aircraft approval by following ASTM standards, which happen to be nearing full government acceptance in Brazil. As the aircraft meets similar standards in other countries and with their long history, gaining approval after an FAA audit seems probable. Super Petrel LS is different from the wave of SLSA amphibians headed to market in America. This water bird is a biwing model. Why? Simple. Seaplanes have a first duty to get on step and launch, to escape the "stickiness" or "surface tension" that occurs when moving at flight speeds in water (especially smooth water). Long wings could provide that as well but long wings are more difficult to maneuver in beaching or docking situations. Two sets of wings generate additional lift yet are relatively short in span. In all, this can be an ideal solution though the lower wing and low fuselage position may not encourage operation in rougher water. Let's fill in some blanks. That shorter span is just under 29 feet. Empty weight is a surprisingly svelte 775 pounds according to the factory depending on what equipment the owner wants installed. 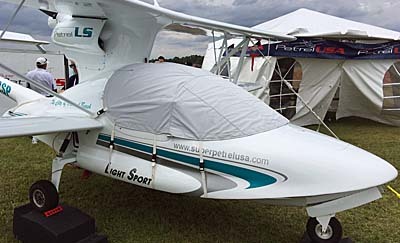 Gross weight does not use the 1,430 pounds allowed under LSA rules, instead coming in at 1,320 like most Light-Sport landplanes. This still yields a useful load of 545 pounds. As Super Petrel carries 25 gallons of fuel, that produces a payload of 395 pounds, which translates to two 190-pound occupants and allows a few pounds for baggage. As Icon is seeking a weight increase exemption to 1,680 pounds, Super Petrel does indeed seem quite light on her sponsons. This helps the design to leave the water in less than 400 feet, according to published specs; it can lift off of a runway in just 260 feet. Super Petrel cruises at a hair under 90 knots, not surprising for a seaplane biplane. Never exceed speed is listed at 114 knots. Stall is a mere 35 knots Edra reports, again a product of twin wings and 161 square feet of area, which results in a wing loading of only 8.2 pounds per square feet. Note that specs were updated 1/9/13 upon advice from Edra. Super Petrel LS is a handsome bird with a broad comfortable interior. You can fly doors on or off. U.S. importer PS-Bird principals think they can sell the aircraft for an attractive price. Various panel choices will be offered, though seaplanes commonly are simpler aircraft flown in a more seat-of-your-pants style rather than on autopilot at higher altitudes on the straightest possible track. If Super Petrel LS catches your interest, the best solution is come to Sebring 2013 and check it out in person. Sebring starts next week … yes, next week! A new year is here and for nine years now that means it is time for the Sebring U.S. Sport Aviation Expo, or just Sebring LSA Expo if you prefer. Executive Director Jana Filip and her team have been putting in the long hours to get ready and to enlist all the right exhibitors. You should get to see all the Light-Sport and other light aircraft you want in this concentrated event. One of those aircraft has not been seen in America for years and even then not as the Super Petrel LS. Longtime veterans of recreational aircraft might remember the Petrel — it’s been around for more than 10 years — but this soon-to-be SLSA entrant will look fresh to nearly everyone. 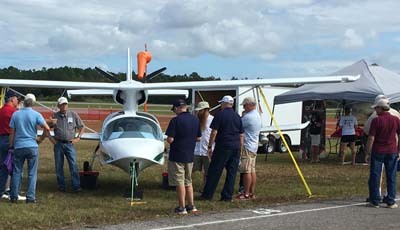 New Flight Design dealer and Florida Light-Sport Aviation owner Brian Boucher is assisting airport neighbor Jerry Scheid to bring this first-of-its-kind Super Petrel LS to Sebring for your closer examination.